moving bed bioreactors (MBBR) process is the new waste water treatment process developed by Norway Kaldnes Mijecpteknogi company and SINTEF company, it combined the advantages of traditional Fluid Bed process and Biological Touch-Oxidation process, has good effect on denitrification and dephosphorization, it is widely used in the industrial waste water treatment and municipal waste water treatment. 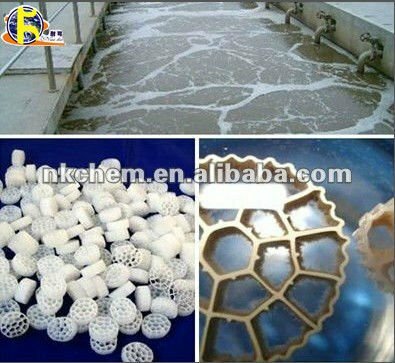 The waste water go through the suspending media of MBBR( moving bed bioreactors )reactor, form the biological membrane on the surface of the media gradually, with the action of the microbial on the biological membrane, the waste water is purified. The media can move freely in the reactor with the mixing of the water; For the aerobic reactor, the aeration will make the media move; For the anaerobic reactor, mechanic mixing will make the media move. It combines biofilm and activated sludge process in the same treatment unit. it improve the ability to remove BOD/COD and strengthen the function of denitrification and dephosphorization. such process is suitable for the remounlding of activated sludge process, no need of rebuilding.